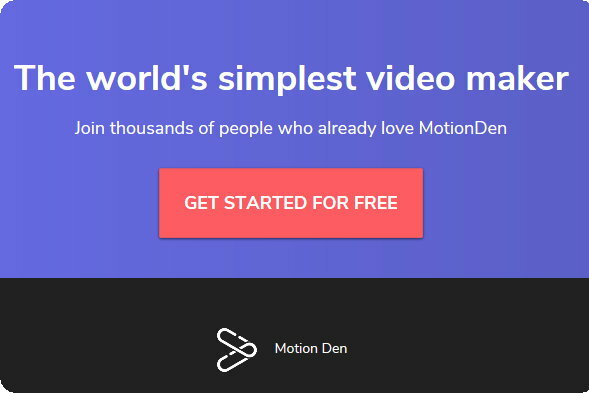 Motion Den claims to be the world's simplest video maker of intros and slideshow style animated videos. I needed an animated slide show to promote my etourist Skateboards online store, which I planned to make myself with one of the many video editing applications I have, but, after being directed to Motion Den by a spammy, completely unrelated comment on this very blog (which I've since deleted), I thought I'll give them a try. The site is free to sign up and make videos with. Any published videos will have the Motion Den watermark. If you wish to remove this you can purchase individual videos or sign up for one of their plans, which give you a certain amount of credits each month to purchase videos with. 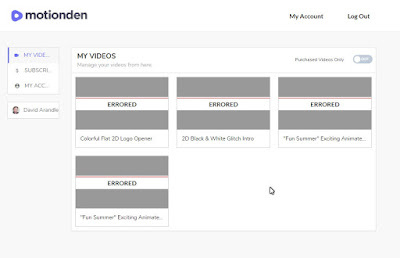 Note that you can't actually do anything with a published free video other than view it in your account. There are no share options and you can't download it (making the watermark almost pointless). A selection of Motion Den's Templates. 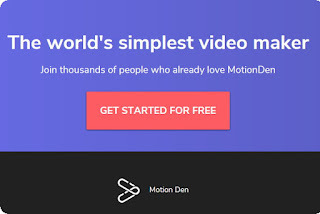 Motion Den is a template based system, meaning you choose a template, substitute your own photos and text, and you're good to go, instant, professional looking animated video. Nothing wrong with that at all. It's a good, time saving option if you can find a template that suits your needs. 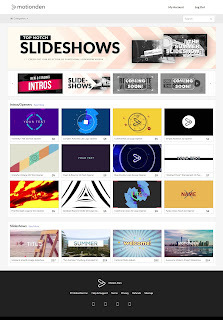 At the time I signed up there were just five slideshow templates, most with music attached to creative commons licenses. Not a big issue but might be if you intend using the site for commercial projects. Quite by chance, the template I liked featured music that was licensed for commercial use. Using Motion Den's video design is a breeze. Each editable component is clearly labeled. Just click on the element to add text or to select and/or upload a photo. Photos can be cropped to fit the template - so you don't need to do this before hand. 'Saving Image' dialogue a lot! One thing Motion Den isn't, is quick. At least not if you're uploading photos at the standard resolution of your typical phone camera. The actual upload seems fairly quick but, once you select the image for your project it takes much longer for the image to be saved into it (in most cases on my project, noticeably longer than the actual uploads - I wrote most of this review during the many wait times!). The site also claims to save you more time for doing the things you love but it took me the best part of three hours to edit 23 scenes in my template. That seemed overly long compared to other solutions I've come across. There also doesn't seem to be any way to preview your video properly to see how it's going. Then, once you hit 'Make Video', you're warned that you won't be able to make changes to the project anymore. Personally I think the whole thing could be improved if you could bulk upload all your photos in the order you want them to appear, then just run through the template and crop, position or swap photos around. I found it frustrating constantly waiting on images to be saved into the project. (If I wasn't writing this review I would probably have given it away). Below is the only video I've successfully processed and published to date (more on that in the footnote below). It's not the video I describe editing above, it's a one image, one text box (that had a character limit too small for my etouristskateboards.com URL) logo splash. For me the process was certainly simple and easy - especially for the above video which took seconds to create but hours to process. On my initial 23 image video it was just way too slow with lots of waiting around. The amount of time I spent putting that together I feel wasn't that much less than how long it may have taken using a standard video editing application. If you don't know how to edit photos into a slideshow, or don't have a quicker slideshow application available then Motion Den may be worth a look (though read my footnote first). 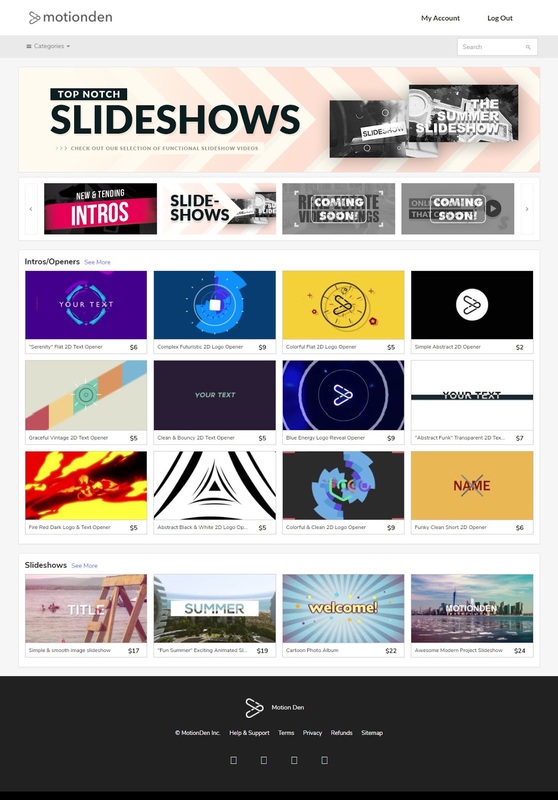 At the moment the site appears to be relatively new with many more templates for intros and openers than slideshows - so if you're in need of a professional looking opener for your videos this could well be worth a look. I'm not altogether sure if signing up for a plan at anything other than the lowest level is worth it as it's unclear as to what extras you get at each level. However given you can use the site for free you can certainly spend as much time as you need evaluating how useful Motion Den will be for you. The video that I started out creating for this review ultimately failed to process. It was stuck at 5% processed for days. I tried creating several other videos just to see if it was an issue with my specific video but all got stuck at 5% processing for days. I contacted Motion Den's support team but have yet to hear anything. Yeah... that doesn't look good. All my videos were marked as 'Errored' and no longer accessible. Further investigation revealed that all but one of the site's templates had been taken down. The remaining template I managed to customize and successfully process as the example video I posted above. If you're reading this, long after I wrote it, and the site appears to be well populated with templates and working again, then my review, I believe, is a fair assessment of the process up until my videos got stuck in processing hell. I contemplated not posting this review but I'd already invested quite a bit of time and whoever brought the site to my attention with their spammy, generic blog comment deserves the karma of a less than stellar review. After my initial video failed to process I still needed to create my animated slide show for my skateboard shop. A Google search brought my attention to a similar site called Render Forest. Render Forest is just like what Motion Den should have been only better in every way. I was able to make a quick, seven second video ad that looked very cool in under an hour, including processing time and purchasing a high quality download. I posted that video to my Instagram, Facebook, and Twitter accounts and have embeded it below. happy you'll be with their service. I plan to write a more complete review of Render Forest at some point but, if you're looking for a site that will help you make intros, slideshows, music visualizations, and more using templates as a base then Render Forest is definitely a great option, and certainly better than Movie Den. You can even download your free published videos. Hi Mauricio, thanks for stopping by. I took a brief look at your updated site but, unfortunately, didn't notice any compelling differences to what I've already outlined in my review... other than your site appears to be up and working again, of course. Your service is still buggy, at least through Chrome browser. I can't seem to delete videos from my account. The delete function doesn't actually do anything once you click the delete button. I'd still recommend RenderForest over Motion Den. Their service is streets ahead, and their customer service is prompt, and helpful (whilst your comment is the first I've heard from MotionDen since I contacted your support 2 months ago). 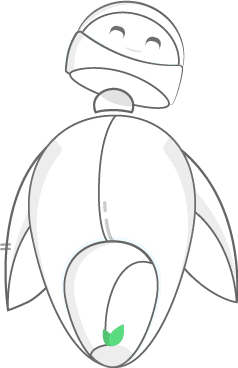 Top selling explainer video companies are the biggest and most feature packed Animated explainer videos Toolkit with Character Animation Maker on the world market.It is the most popular animation and expaliner. Most interesting site.I hope this may help in where is the real webnike marketing company because Before some time take in a service It was so good provided service. Student's need always the exams time paperhelp process in the more Technic thinks but it is very dangerous time. We ought to complete a personal investigation and on the off chance that we are sentenced to quit viewing a specific anime, we should not underestimate it.